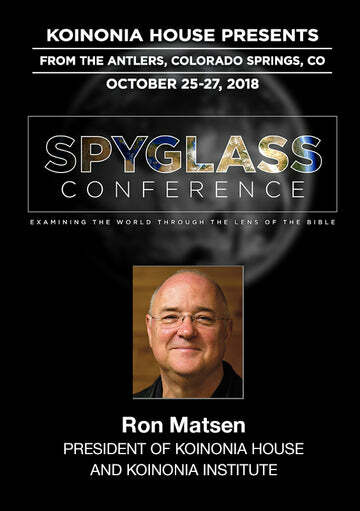 This is the first of a series on “the Boundaries of Our Reality”: an exploration of some of the most relevant discoveries of modern science and how they impact our Biblical perspectives, as we continue on our adventure within this interval between the miracle of our origin and the mystery of our destiny. 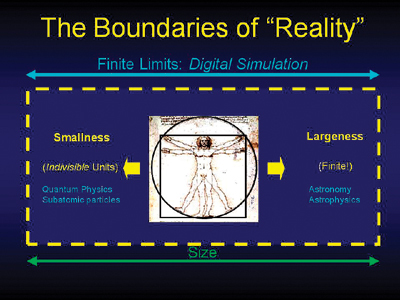 The concept of “infinity” is a mathematical concept that remains elusive in our exploration of the physical universe. The startling discovery of 20th century physics is that our universe is finite, not infinite as was commonly presumed. It may be expanding, but it is not infinite. We appear to be journeying within the interval subsequent to that initial singularity, commonly known as the “Big Bang,” and an ultimate thermodynamic heat death as the universe continues to drift into a uniformity of temperature in which no more work can be done. Most astonishingly, it is the absence of “infinity” in the microcosm—the world of smallness—which is perhaps the most challenging of all. We need to gain a grasp of the relative sizes of things in the subatomic world. For example, let’s consider the simplest atom of all: that of hydrogen. It is usually represented by a nucleus of a single proton, surrounded by a single electron. This diagram is, of course, not to scale. It is important, how-ever, for us to gain a glimpse of that scale. The hydrogen atom is approximately 10-8 cm in diameter. Its nucleus is approximately 10-13 cm in diameter. The ratio of these diameters is 10-8/10-13, or 105. 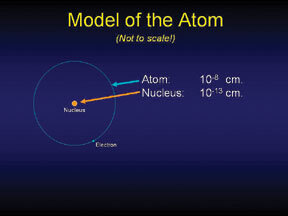 The diameter of the atom, thus, is about 100,000 times larger than that of its nucleus. If you were making this model to scale, using a golf ball to represent the nucleus, the electron would have to be over three miles away! But that’s not the whole story. For the area covered, that length needs to be squared: (105)2; for the volume involved, it must be cubed: (105)3 or 1015! The significance of this volume is extremely difficult for anyone to fully grasp: the nucleus of the atom has the same relationship to the space that the atom occupies as one second has to 30 million years! Furthermore, we also now discover that the ostensible constants of physics are, apparently, changing. In a provocative article in Scientific American,1 it concluded that if these constants are indeed changing, it implies that our reality is but a mere “shadow” of a larger reality. That’s what the Bible has insisted all along! One of the most useful insights from modern physics comes from the insights of Dr. Albert Einstein: that time itself is a physical property, and that it, too, is not uniform, nor absolute, nor linear; that time varies with mass, acceleration and gravity. The realization that time is a physical property also facilitates our dealing with the ostensible paradox of predestination versus free will, which has stumbled philosophers for centuries. We do, indeed have “free will.” However, God is outside the restrictions of our time domain, and He (alone) has the ability to “see the end from the beginning.”2 He knows our choices in advance. This appears as a paradox only when viewed from within the time domain. He is outside of those restrictions. Incidentally, even time is composed of indivisible units: there is no time shorter than 10-43 seconds—the mini-mum “Planck” unit of time. The study of dimensions more than our familiar three deals with what are called “hyperspaces.” Many of the most advanced issues in quantum physics—as well as many of the encounters we find in the Biblical text—involve a study of hyper-spaces.4 Many of the events of history, as well as some of our most advanced contemporary challenges, appear to involve hyperspaces. Some provocative queries which emerge include: Are angels trans-dimensional? What about UFOs? Is time travel possible? Prior to the events in Genesis chapter 3, did Adam and Eve live in only four dimensions? Was the schism of the inherent ten dimensions, into four and six, one of the results of the Fall of Man? We plan to accompany this series on “The Boundaries of Our Reality” with revised editions of Beyond Coincidence, Beyond Perception, and a fourth surprise which will explore some of the myths that have deceived our contemporary technological culture. It promises to be a provocative ride, indeed! 1. “The Constancy of Constants,” Scientific American, June 2005. 2. Isaiah 46:10, 57:15; et al. 3. Ephesians 3:18 lists the four dimensions. 4. 1 John 3:2 is a provocative example.